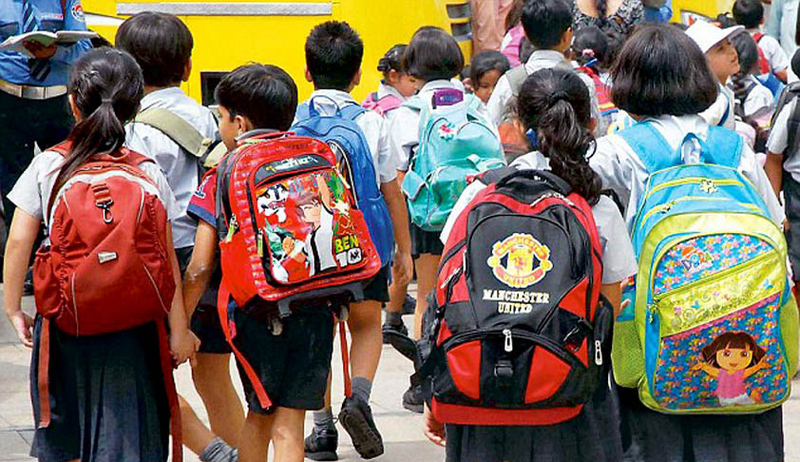 The Bombay High Court on Thursday directed the State Government to inform it, within two weeks, of the date on which it will implement a panel's recommendations for reducing the weight of school-bags and action that would be followed on schools which fail to implement the resolution. Social activist Swati Patil had approached the court, seeking directions to reduce school bag weight. A Bench of Justice V M Kanade and Justice B P Colabawalla heard a Public Interest Litigation by Patil for reducing the weight of school bags. The Bench observed that often mothers are more ambitious and they send their children to different classes, like swimming, karate, and drawing, after school, which results in the kids having to carry extra books in their bags, increasing the weight. It was also stated by the Court that children go to tuitions and carry those books to school. The Government cannot do anything except impose regulatory guidelines in such a scenario. Parents and schools have to take care of this. Government's advocate Anjali Helekar said the General Resolution (GR) has bifurcated what the schools and parents have to do. The Report includes recommendations such as using one book for three months for each subject, textbooks with weight less papers and without hardcover to reduce bag weight, use of e-classroom, audio- visual technology and other technologically advanced methods of teaching. Read the related story here. Patil, in her Public Interest Litigation, has produced a certificate issued by a doctor from KEM Hospital, stating that children may suffer from backaches, spondylitis, neck pain and other orthopaedic problems if they continue to carry heavy bags regularly to school. As per a committee report, children are carrying school bags 20-30% heavier than their age, because of which around 60% students below the age of 10 suffer from orthopaedic as well as stress-induced ailments.